Healthy Hummus – A super easy kid-friendly recipe for a quick healthy hummus snack- add some raw vegetables to dip in it and enjoy! – chick peas (garbanzo beans), tahini (( sesame seed paste)), crushed garlic, of half a lemon, ground cumin, water, paprika for serving, olive oil for serving, himalayan salt, Whizz all the ingredients in a blender or food processor for a few minutes, or until you have a smooth silky paste, adding water at the last step until you get the thickness you want. Add more water, if you prefer a thinner hummus- remember that hummus has a tendency to thicken after a few hours. ; Adjust lemon juice and salt to your taste. 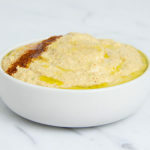 ; To serve- pour some more olive oil over the hummus and sprinkle with some paprika. ; Hummus keeps in the fridge for 3-4 days. ; – Change your hummus by adding some raosted red pepper to it- grill a red pepper unil the skin blackens all over- pop the pepper into a plastic bag for 15 minutes to allow the skin to loosen- slip off the skin, remove the peppers, and process the pepper with the other ingredients in the blender. This will have a lovely pale red colour. Other possible additions to add more nutrients are artickokes, or zucchini. A super easy kid-friendly recipe for a quick healthy hummus snack- add some raw vegetables to dip in it and enjoy! Whizz all the ingredients in a blender or food processor for a few minutes, or until you have a smooth silky paste, adding water at the last step until you get the thickness you want. Add more water, if you prefer a thinner hummus- remember that hummus has a tendency to thicken after a few hours. Adjust lemon juice and salt to your taste. To serve- pour some more olive oil over the hummus and sprinkle with some paprika. Hummus keeps in the fridge for 3-4 days. Change your hummus by adding some raosted red pepper to it- grill a red pepper unil the skin blackens all over- pop the pepper into a plastic bag for 15 minutes to allow the skin to loosen- slip off the skin, remove the peppers, and process the pepper with the other ingredients in the blender. This will have a lovely pale red colour.